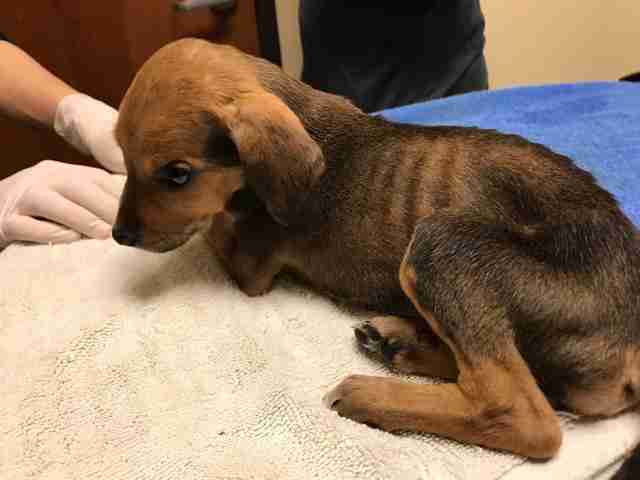 A man and his wife were walking through the woods in Texas last winter, when they came across a box of scrawny, emaciated puppies in the middle of the forest. The box was sealed and and had the instructions "shoot me" scrawled on the side. Six in total, the puppies were later estimated to be just 1 month old. 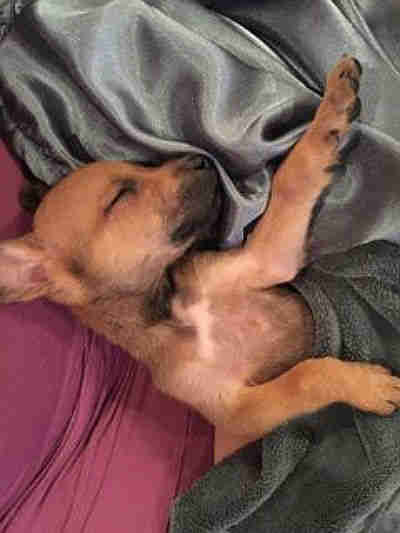 The woman quickly called her aunt-in-law to help, who then got in touch with a woman named Karen Rene'e, a volunteer with The Underdog Project, a Dallas organization that provides medical care and homes to neglected dogs. 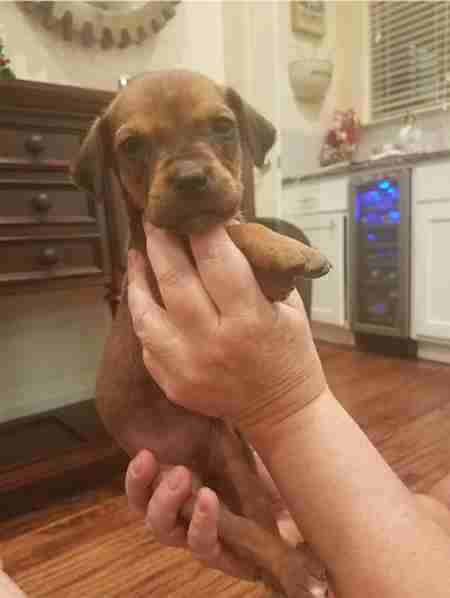 The day after Christmas, Rene'e rushed to Gary, Texas, to meet the aunt (who chose to remain anonymous) in the parking lot of a McDonald's to take the puppies. Leslie Ysuhualyas, founder of The Underdog Project, then posted a Facebook plea that painted an ugly scene. "The words 'shoot me' meant more to the hunter than the [six] lives breathing in the box," she wrote. "He wanted to shoot them, he had to be convinced not to kill them." "The aunt told me she did not want the expense or commitment - simply didn't have the resources," Rene'e told The Dodo. But, the aunt thought saving the puppies was "the right thing to do," according to Rene'e. 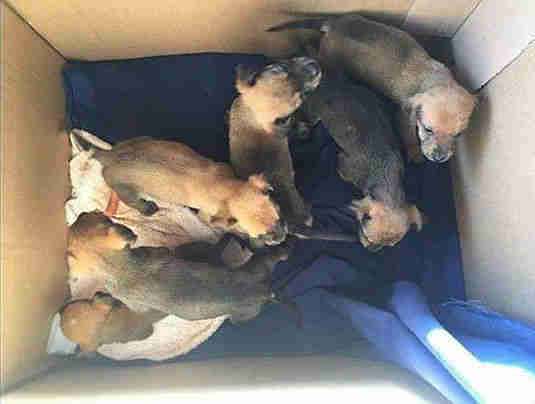 An initial vet check-up didn't turn up any specific illnesses, though the pups were malnourished and sustained various injuries. One of the females had an infected bite on her face, and the tail of the runt of the litter was nearly bitten through. 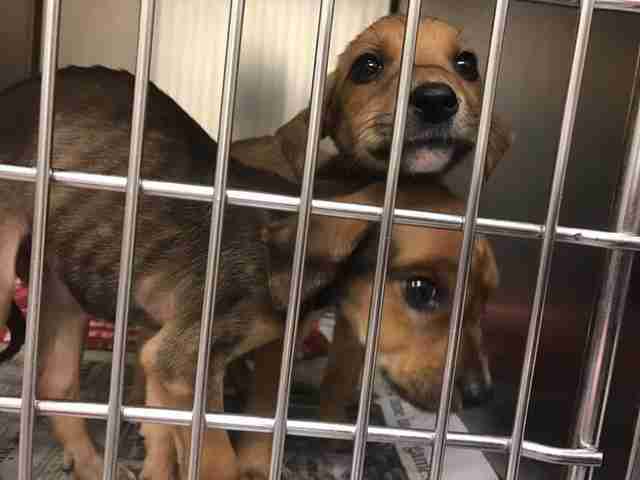 "Just looking at the puppies, anyone could say that they were really sick," Rene'e said. 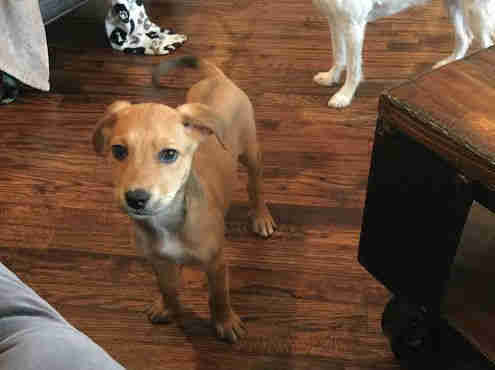 Because of their heroic tale of survival and strength, Rene'e named the pups after Greek gods: Aries, Aphrodite, Athena, Atlas and Apollo - the smallest pup was named Hera, after the queen of the gods. "I thought they needed every advantage we could get," she said. 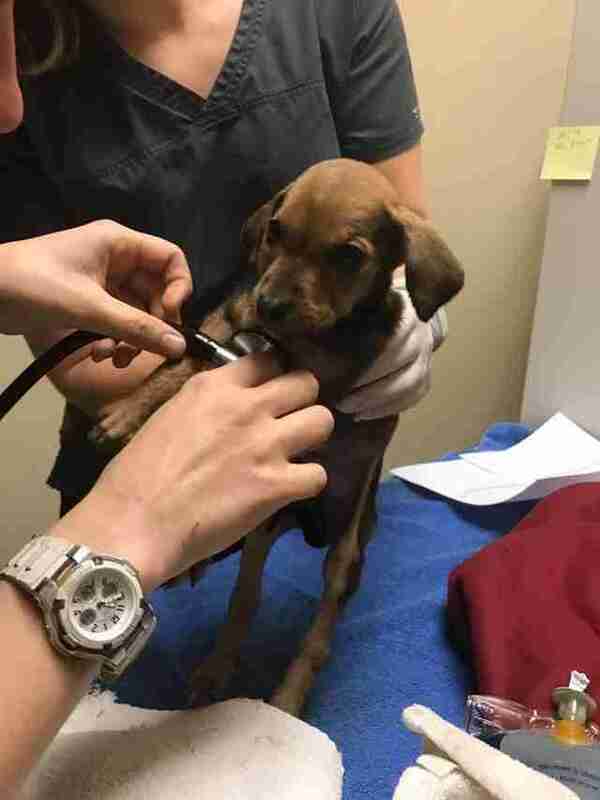 The health of three of the pups started to fail and they were rushed to an emergency vet. Sadly, Aphrodite and Athena didn't survive, likely because of a bacterial infection, but Aries put up an amazing fight and was able to be saved. Once Aries recovered, he went back to live with Rene'e and his siblings. "He is quieter, sweeter and more of a lap dog now than the others," Rene'e said of the pup who nearly didn't make it. Still, Rene'e was shaken by the loss of Athena and Aphrodite - the first in her time as a foster. "[It's very difficult] when you do everything right, and sometimes they still don't make it," she said. "Oftentimes it's the silent things going on inside of their body that you can't predict - and that's what will break the progress." Today, however, the remaining four puppies - Aries, Apollo, Atlas and Hera - are in good spirits. They love to run and play games, just like puppies should. "The three boys love to play tag and occasionally get stuck under the sofa, where they cry like babies until we help them out," Rene'e said. During their time in Rene'e's care, the puppies have become very close with her daughter, Blakeleigh. 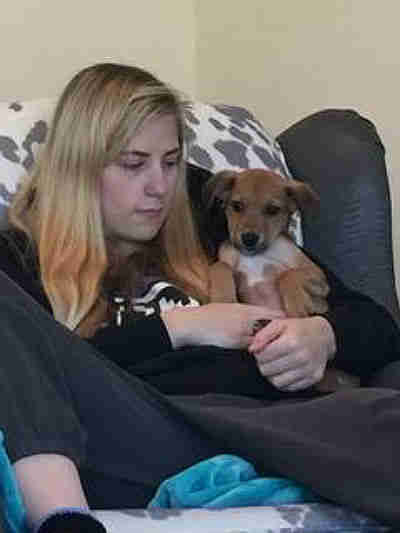 This bond is especially touching because Blakeleigh was also adopted, and she struggles with multiple sclerosis and recently went blind - the pups and Blakeleigh comfort each other as they heal. "The dogs think Blakeleigh is their mother," she said. Being blind, Blakeleigh is very "hands on" with the pups, which has helped them attach to her, Rene'e said. Rene'e, on the other hand, has formed an extra special bond with the smallest pup. "Hera appears to be blind in one eye and I am considering keeping her," Rene'e said. "The day we got them, I [thought] she was going to die. I carried her around in my sports bra for nearly three weeks [because] she was always so cold and tiny." 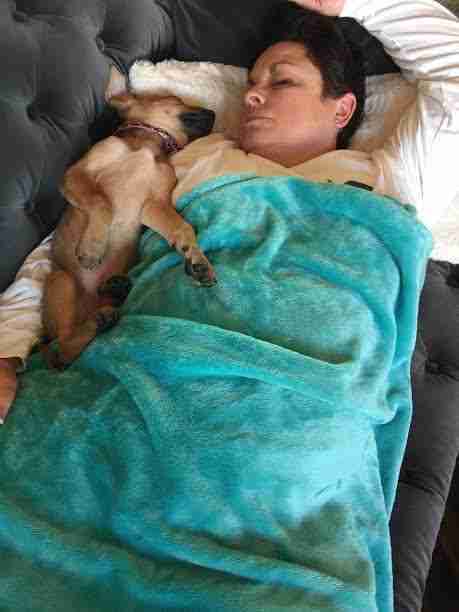 In fact, the dogs can't seem to get enough cuddling time with Rene'e's family or each other. 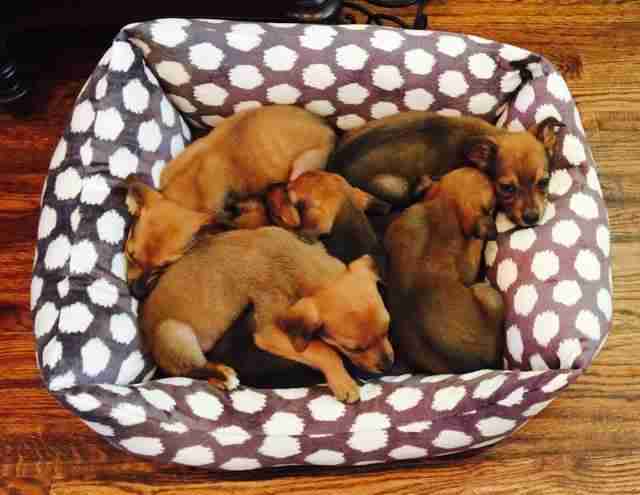 "They can't stand to be by themselves and snuggle in 'twosies,'" Rene'e said of the pups. When they fall asleep while being held, they will nurse on Rene'e and Blakeleigh's fingertips. 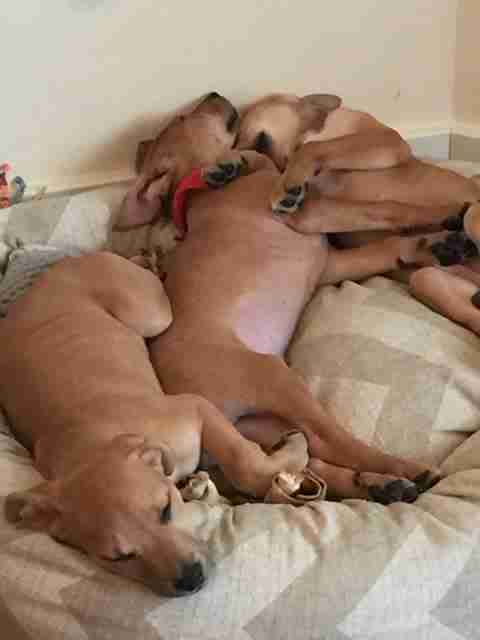 The pups are now healthier than ever and looking to be adopted. 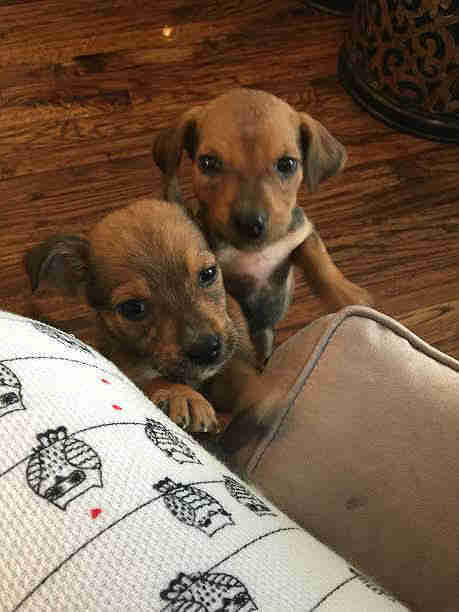 "They are all strong and ready for their forever homes," Rene'e said. To adopt one of these special pups, fill out an application. More information can be found on The Underdog Project's Facebook page.